If you have U.S. dollars in a U.S. bank account, you can buy digital currency (e.g. Bitcoin) online with these U.S. dollars. Use an online platform to fund your Bitcoin purchase backed by a bank account. Imagine a place where you can open an account online, the account is also your Bitcoin wallet. 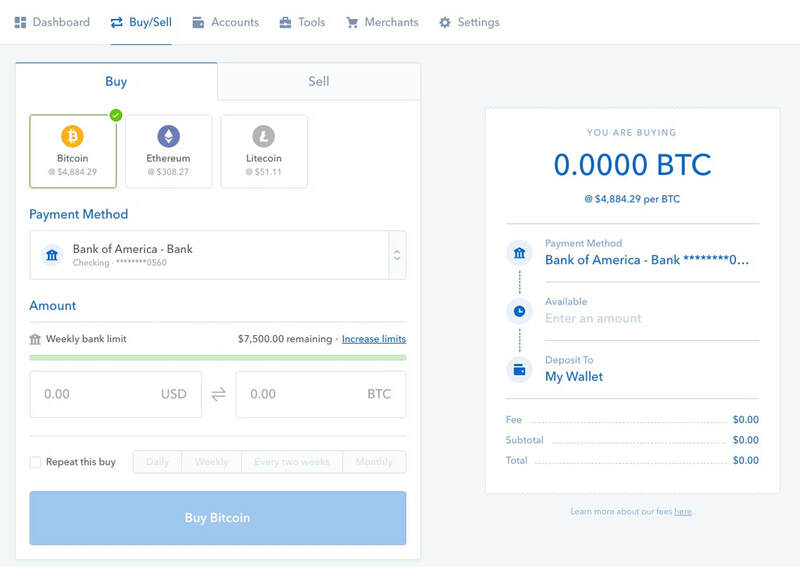 Once you're in the account, you can link your bank account and use the fund in the linked checking account to buy Bitcoin at the market price. Based in San Francisco and backed by many investment rounds from trusted investors, Coinbase is the largest online platform in the U.S. where it is both a Bitcoiin wallet and also a simple exchange for buyers to buy Bitcoin. 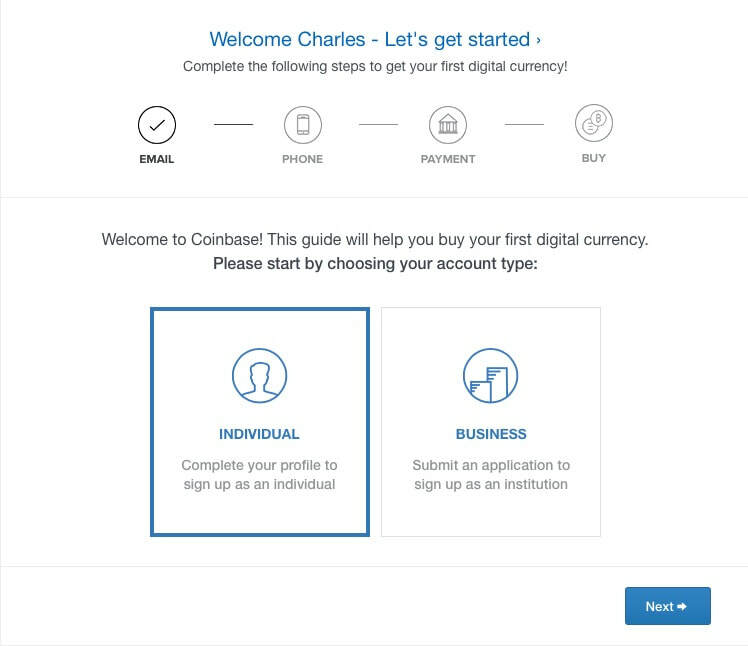 Coinbase is popular, trust-worthy, and available for Bitcoin users 18+ years of age in the U.S.
Go to Coinbase, click on "Sign Up", Choose your password and create an account. Check your email and verify your email. 2. Choose your account type. 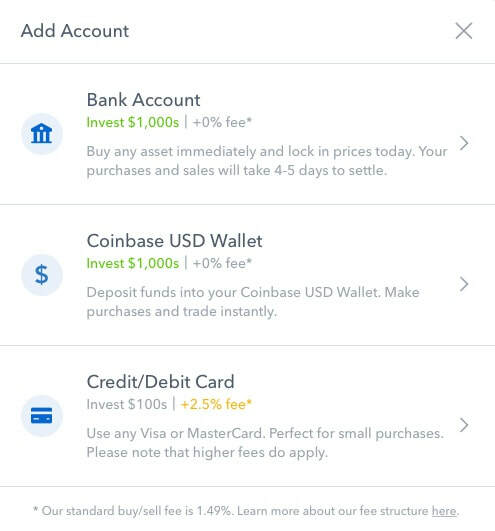 Choose between 'Individual' and 'Business' account type on Coinbase. If you are not a merchant and do not need to accept eCommerce payment in Bitcoin, select 'Individual', then choose your country. 3. ​Tie your real phone number to the account. To prevent unauthorized log in, you need to provide your mobile phone to receive 2-step verification code for every sign-in. 4. Know your payment options. 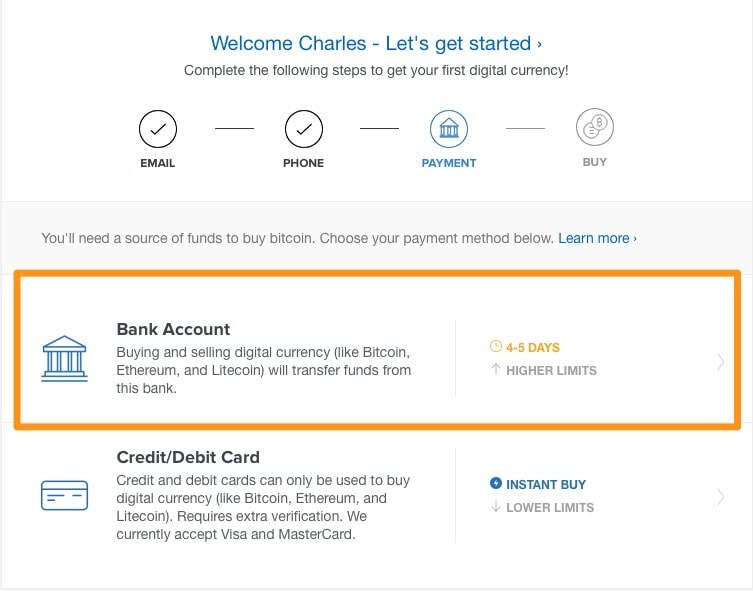 For your information only, Coinbase offers 3 different payment options - Bank Account, Coinbase USD Wallet, and/or Credit Card - for your Bitcoin purchase. 5. Connect you bank account to fund future Bitcoin purchase. We suggest you to opt for funding your future purchase with bank account as opposed to credit card. With bank account linked to your Bitcoin purchase, you'll have higher purchase limit and pay lower transaction fee (1.49% fee via bank account vs. 3.99% fee via credit card). 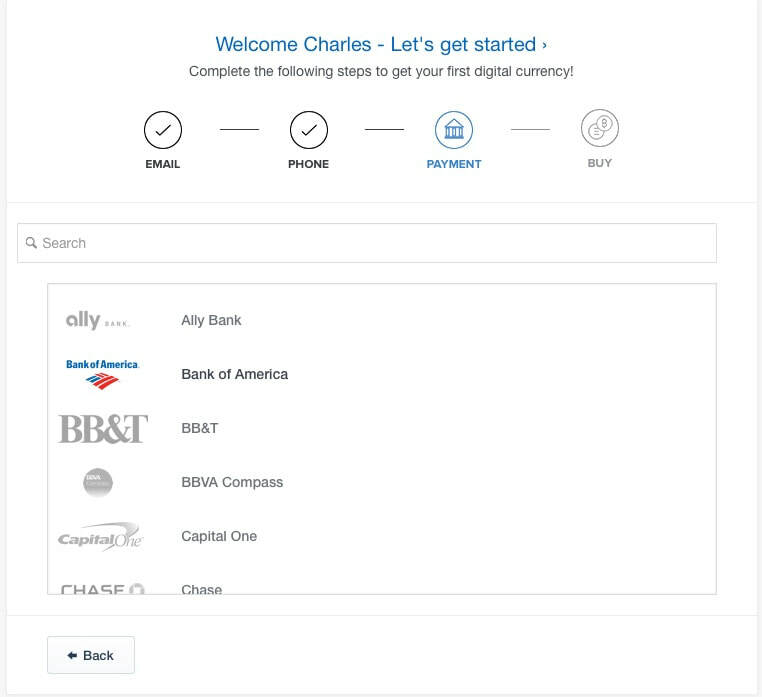 If you choose by pay by your bank account, Coinbase offers you a list of U.S. banks to choose from. Once you select your bank you want to link to, it will prompt you to enter your bank's log in credential. 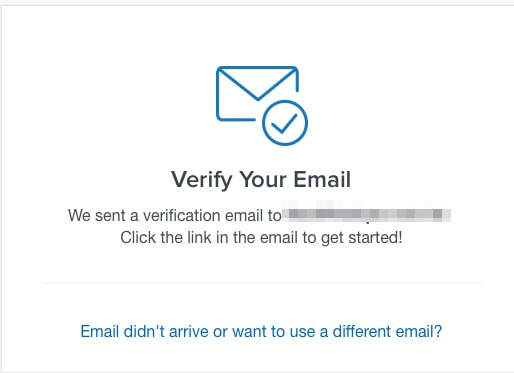 You'll need to complete some verification steps before you can use the account. 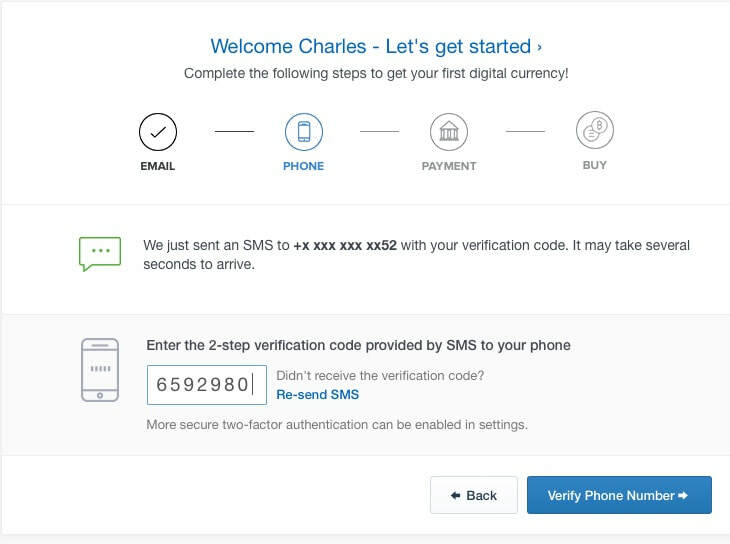 Once the verification steps are complete, you can start a purchase. The exchange rate from USD to BTC is the market price on GDAX Bitcoin exchange also owned by Coinbase. The price varies from time to time. 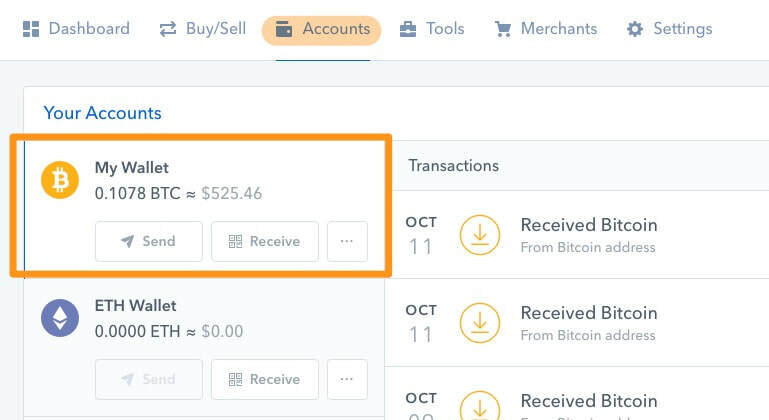 Funding your first Bitcoin purchase with bank account may take 3-5 business days (roughly up to 10 days) for ACH bank transfer system to transfer money to Coinbase to complete the purchase. After the fund has been transferred to complete the purchase, your Bitcoin balance will show under the 'Accounts' tab. Your Coinbase account is also your Bitcoin Wallet, You can then send Bitcoin (BTC) from your Coinbase account to any other Bitcoin address.